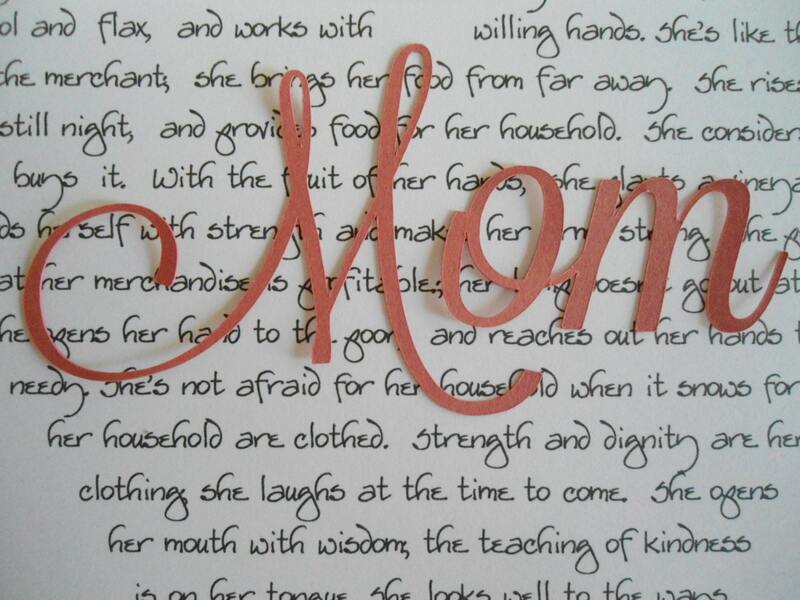 So thankful you're my mom~ thanks for everything! 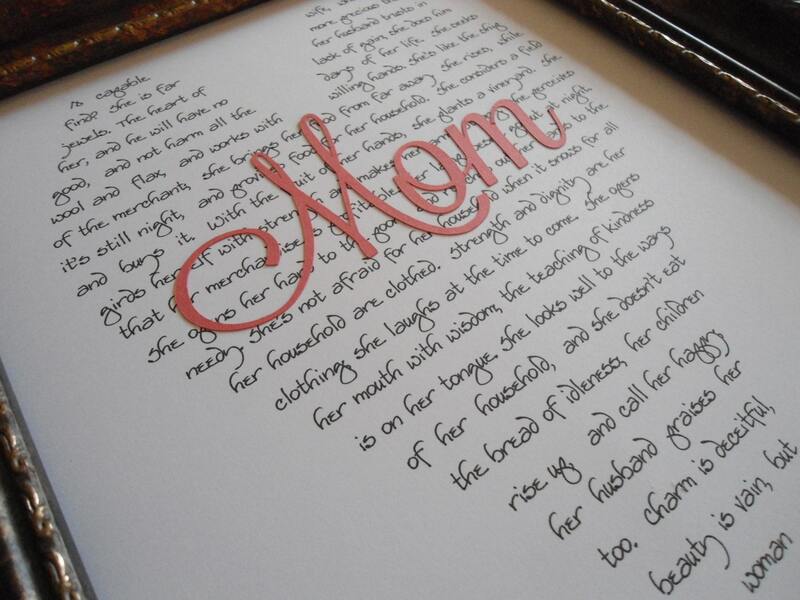 This Mom gift is perfect for your mother of bride gift, or mother of groom gift, our original design, just in time for weddings (mother gifts for bride and groom, or grandmother gift), special occasions (wedding anniversary for your "wife" or her birthday) and other special occasions when you need a gift for your mom or wife for! This would also work as a thank you gift for women in ministry, Sunday school class teachers, small group leaders, or other Christian women events. This is similar to my other 8 x 10 prints I've formatted in the shape of a heart, but this print has words from Proverbs 31, the Bible scripture about a woman of God. These exclusive designer prints are perfect for one of a kind birthday gifts or for other special life events as well. 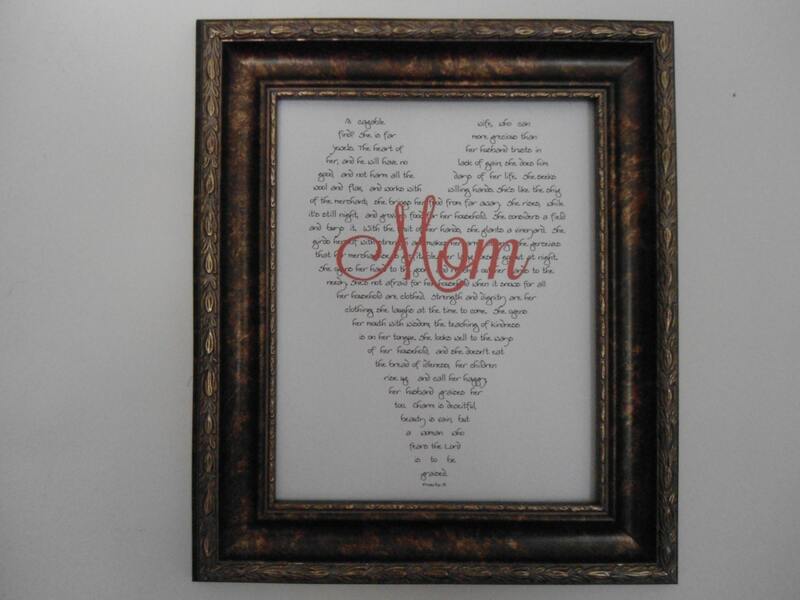 If you're getting married, you could give this as your present to your mom and to his mom-she'll love it and she will have a handmade keepsake to frame and cherish forever. 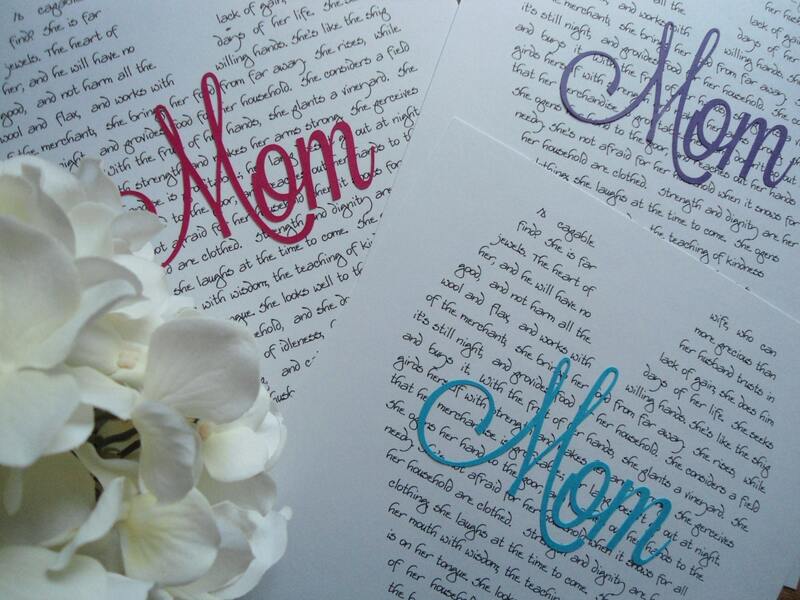 Your custom print will be on heavy white 8" x 10" 110# premium cardstock; I've formatted the text and printed it in my signature font, and then added the word "Mom" (in script as shown in photos 1-4) on top. This listing is for the 8 x 10 size, the print only. Frame is not included. Feel free to contact me with any questions you have. Please allow us 2-3 weeks to get your print finished before shipping. **** If you are purchasing for a Wedding AFTER May 28, please remember to allow a 3 week turnaround time before shipping. If you are purchasing for a wedding BEFORE May 28, we are sorry we cannot complete your custom order at this time due to heavy volume of orders. ****Contact me if you are past the deadline, and if we can accommodate your order, and if you pay the $15 RUSH fee, then perhaps we can get your ordered shipped in one week instead of three-it depends on how many orders we are already processing. 1. What color letters do you want the word to be? 2. IF you'd like to add one short line of personalization, type it in here as you check out. This listing is just for the PRINT, NO FRAME or MATTE is included. NOTE: This is an exclusive Beach House Dreams™ design (including all of my 5 x 7 and 8 x 10 prints with customized words around the central image), the heart, "dad", "mom" "friend" and "sisters" designs. You may not copy or reproduce this design without my permission. Please respect my original designs. Very expensive for what you receive. The layout of the picture is beautiful but overpriced. A piece of card stock cost me $30+ if I wasn't so in love with the layout I would be upset with this purchase. Absolutely beautiful. My mom loved it! Fast delivery too.